I have become fond of movies since my early age. My mama and maavashi used to give money to buy tickets for me and my brother. And in those days, since we were kids below 12, we were allowed to get in to ladies class which was generally cheaper than stall or dress circle or balcony tickets. My affection to movies rose to such level that at one point of time my goal of life was to become ticket collector at cinema theaters so that I can watch all the movies without paying a single dime for it. Movies have become core of my life. I found myself using movie plots, dialogues and situations as examples to people around if I have to make a simple point or give them some advice. It happens so unknowingly that it takes sometimes a long period for you to know the real cause of your behavior. In my case it took almost 2 decades. This year I saw some really good movies at Pune International Film Festival. These movies do not follow a template approach where (a) wins the heart of his girlfriend beating all odds in the process, (b) or he raises from rags to riches, (c) or plays a love sacrificing friend for another friend. In these film festivals the heroes are like people sitting in your neighbor. They are the boys or men just like any other ordinary people with very subtle point to make without any extravaganza. Today in elevator I met a colleague who have kept a wolverine style beard. I told him that he's looking good in this new look. But he was not very much excited to hear this praise. Then he opened up saying that his boss doesn't know the wolverine. He then tried explaining his boss the character with reference to X-Men. His boss was not aware of this move either. He was disappointed that his efforts made no sense to his boss. I learnt one more lesson. One should know and be able to talk the language of his/her juniors. It's not easy to know everything that your juniors might know but a little curious enquiry will make them happy and as a result productive. An afternoon lunch with friend, while Rio Olympics topic was talk of the town, led to an interesting debate - Will viewership improve sports performance in India and score at Olympics? My friend Abhishek, being an optimistic person, chose to take on the side of YES. And I had an obligation to support NO as I wanted to have a good discussion. ‘Talking while eating is not good’ is a myth, in my opinion. If you are exercising your jaws for chewing then might talk as well. His first point for YES claim was - more awareness means more viewership, more viewership means more sponsorship, more sponsorship means more funding for sports, more money means lucrative career opportunity and good career means encouragement from parents to make sports as primary source of living. Very valid and logical point. My counterclaim was simple - are parents considering Cricket as means of living for their kids in India despite it being one of the richest sports? Result tie. His second assertion came in - more awareness means more interest. People will at least take a taste of that sports which might become their passion later. Again a superb pitch. If we are not even trying then we can’t improve our winning. My take was simple again - has more news channel helped improve the interest in news as compared to daily soaps? (Note: I am not claiming that watching news is superior to watching melodramatic series.) Result tie, again. And there were several other rounds of reasonings. But result was still a tie. He was representing the positivity of the society and I was advocating the negativity. When I took the side of NO I started with an assumption that for a thing like sports mere financial support, job security or spark of an interest is not enough to make India as world champion. It needs a change of the mindset of the society at large and deep passion about sports. But while the result of the debate remained tie towards the end of our meal, I was convinced that positivity around sports can really make wonders if we have to excel at it and awareness can help create it. He didn’t specify this point explicitly but throughout his debate he was living it. Today is his birthday so this is my way of wishing him a happy birthday. Keep thinking positive! 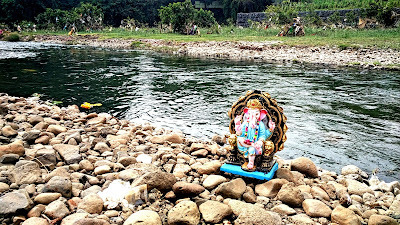 If you walk on the roads of Maharashtra (India) these days, you wouldn’t miss the fervour of Ganapati celebrations. And why not? He is a modern god according to me. He represents medical advancements, in the form of head transplantation, during very early days when only gods used to populate the earth. He can only be stood second to Lord Krishna in his practical dealings of the situations. But what fills my heart with sorrow is a fact that all of his devotees have gone too practical and become very much modern. This love for god has really turned in to a great drama. People are selling Ganapati Bappa (as he’s called fondly) on roads cloaked in very mean raincoat in the form plastic bags. Few goes on to bargain a price of the god on the steets. Who are we to put a price tag to him! 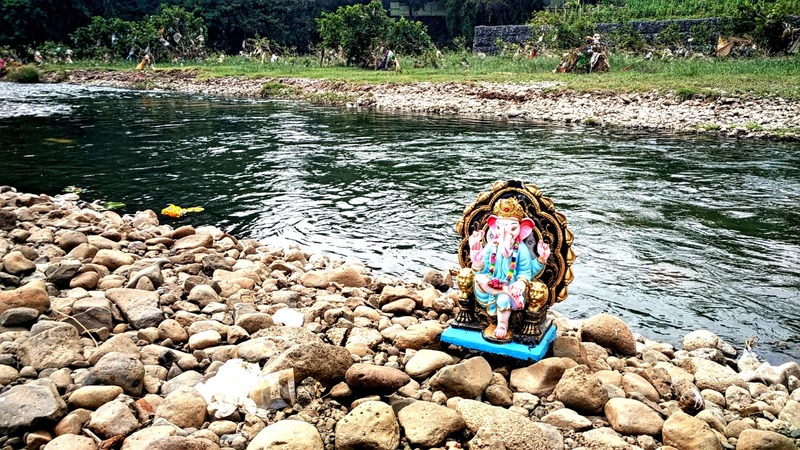 People who are paying premium for an eco-friendly idol of Bappa are glittering their homes with plastics and chinese decorative lamps. What a double standard approach! The god who made us capable to earn and gave us roof is being bought and sheltered! Today I have received another email from Robin Sharma (remember ‘The Monk Who Sold His Ferrari’). No, he doesn’t know me but I get his mailers on a regular basis because I have subscribed to his newsletter. The content is worth reading and I take out time from my schedule to go through it word by word. This time my marketing antennae caught something weird in his mailer which was directed at my inbox with an aim of trying to soothe or connect with me. We marketers believe that the best form of personalizing an email is to greet a person with his name and our job is done. So even this mail opened like ‘Hi Mandar, …’ but lost sense of personalization in subsequent paragraph. It reads ‘Those of you who have secured your seats from across the planet…’ This clearly tells me that he or his marketing team doesn’t know whether I have subscribed to his upcoming event. So he/they chose to address everybody by leaving the personalization to greeting part of the email only. They could have easily done two lists, one who have subscribed for the event and other for people who aren’t subscribed, and written two separate copies. But choosing to save little time exposed their gimmick of personalization. Nothing bad with this. This is better than lot many others who don’t even know who have subscribed for their content. But this was not expected something from Robin. Anyways, it’s a great learning for other fellow marketers!